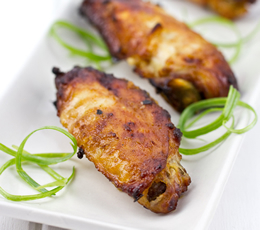 Thanks to Nami at Just One Cookbook, let’s add some Japanese flare to our party wings! These Garlic Miso Chicken Wings are SO GOOD! Line a baking pan bottom with aluminum foil (so that you don’t have to clean later) and oil the broiler rack. Place the chicken on the broiler rack skin side down first. Set the broiler to High and broil for 10 minutes, or until nicely browned. Then flip the chicken (now skin side is up) and broil for another 10 minutes. The cooking time will vary depending on the oven. Thank you so much for the feature! I hope your readers will give it a try!